At the event in Nottingham on Thursday 7 February, they heard how communities and businesses can maximise the potential of Britain’s new railway line, including through tens of thousands of new jobs in the region, with billions of pounds injected into its economy. Regional leaders from all the East Midlands councils were present, alongside MP for Broxtowe, Anna Soubry, and representation from the Department of Transport, the Railway Industry Association, Midlands Connect, East Midlands Chamber and the Derby and Derbyshire, Nottingham and Nottinghamshire (D2N2) Local Enterprise Partnership (LEP). HS2 is already underway and supporting more than 7,000 jobs at 2,000 businesses, including 300 companies across the Midlands. Once built it will be a catalyst for regeneration in the region. The East Midlands HS2 Growth Strategy predicts it will add nearly £4 billion to its economy and around 74,000 jobs. We will continue to work closely with local authorities and businesses as we drive this ambitious project forward, to ensure that the East Midlands benefits from the full potential of HS2. The visit was hosted by Bridgeway Consulting Limited, who are providing ground investigations and engineering surveys to prepare for HS2 in Birmingham and London. Through its contract with HS2 Ltd, the SME has been able to create new jobs and upskill 60 employees across a range of disciplines. Following the roundtable, Nusrat and Allan were given a tour of the company’s Nottingham facility by Managing Director, Pino De Rosa, where they were able to see live structural monitoring and mobile mapping for HS2 sites. 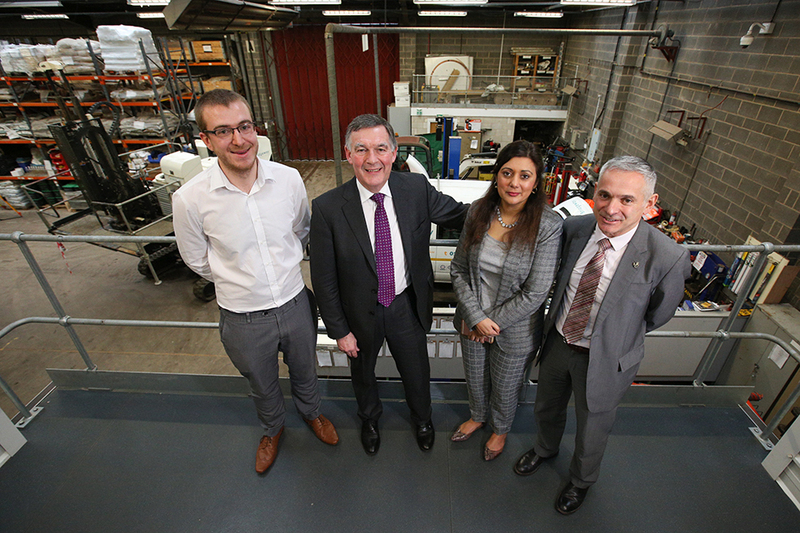 Nusrat and Allan were given a tour of the company’s Nottingham facility. Bridgeway Consulting is a prime example of how HS2 is creating careers and opportunities for local people years before the first high-speed trains arrive in the East Midlands. HS2 requires over 30,000 people to design and build the railway, and what we’re seeing today is just the beginning for this once-in-a generation investment. What is also evident here is the joined-up approach taken by local government and businesses to ensure the East Midlands is well equipped to maximise the benefits HS2 will bring. The government has committed to the Eastern leg of HS2 and it is imperative that this momentum is maintained. Bridgeway Consulting currently employ 10 apprentices, of which 9 have worked directly on HS2. Nusrat and Allan also spent time with some of these apprentices, learning about their training before being given demonstrations of three ground investigation drilling rigs that they have helped operate on HS2 sites. Co-founded in 1995 following railway privatisation, Bridgeway Consulting has grown to one of the leading consulting and contracting companies in the UK. HS2 is a once in a lifetime infrastructure project that will transform opportunities for the people of the Midlands and the North and we’re proud to be working on it. So far the project has enabled us to create a number of job and training opportunities within our organisation and going forward it will give us the confidence to further invest in our people, equipment and technology. HS2 will benefit businesses and communities across many sectors and will have a positive impact on the wider Midlands Engine and Northern Powerhouse workforce. 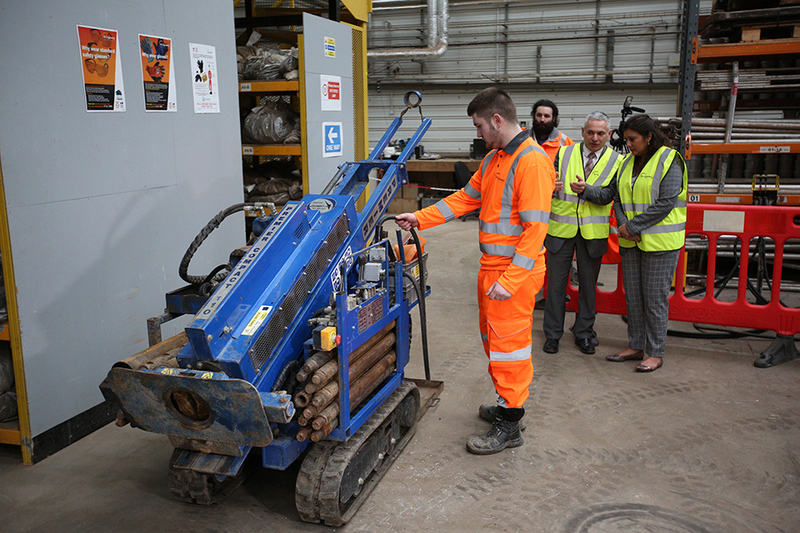 Apprentices demonstrated three ground investigation drilling rigs. From 2033, passengers in the region will be served by a new East Midlands Hub in Toton, Nottinghamshire, which will provide high-speed connections to core UK cities including Leeds, Newcastle, Birmingham and London. It came after authorities and businesses across the Midlands and the North published an open letter to political party leaders calling on them to commit to completing Phase Two. HS2 is a key part of the government’s Industrial Strategy, which aims to deliver growth right across the country. Once built, HS2 will become the first new railway built north of London since the Victorian era, unlocking the potential for hundreds of thousands of jobs and boosting the economies of towns and cities across the country. Construction on Phase One is already underway, which will link Birmingham with London by 2026.